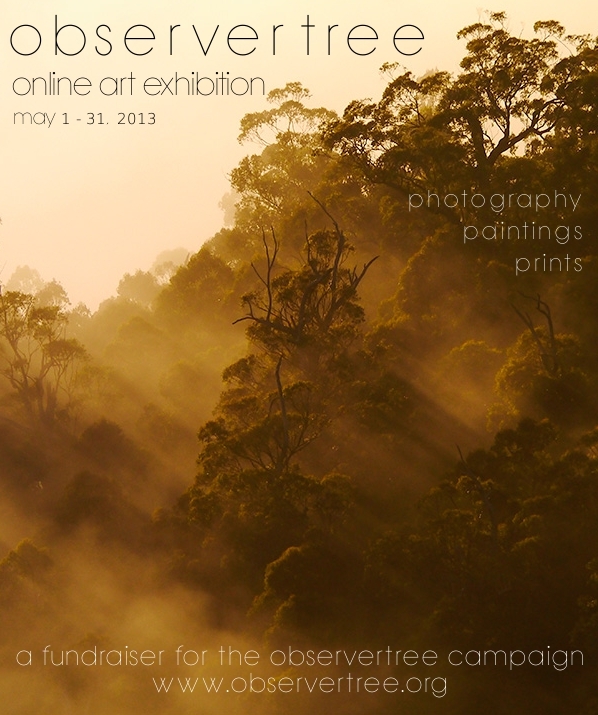 The ObserverTree Online Art Exhibition will run from today until May 31 on the ObserverTree website. Artworks include beautiful photographic prints by Miranda Gibson, taken from up in the tree-sit, and personally signed by her. There are also paintings, prints and photography by artists who support the ObserverTree campaign. Funds raised from the exhibition will go towards the continuing campaign to protect Tasmania’s threatened forests. Please check out the exhibition here, and please share it with your friends and on social media. Posted on May 1, 2013, in Events, Photos. Bookmark the permalink. Leave a comment.